From sea to sky – this trip has it all! Traveling by car, train and ship you go from Vancouver, the pearl of Canada’s west coast, to Victoria on Vancouver Island, then north to take a ferry to Prince Rupert, before heading east to experience the best of the Canadian Rockies. Along the way we offer dozens of carefully-curated activity choices - to help you experience the beauty and wildness of this most spectacular part of Canada in your own best way. Our inside experts are standing by to help you co-create your own best story. From the pristine fresh air wafting in from the Pacific Ocean, to the incredible vistas of sea and mountains that greet you daily, this journey is one to refresh your heart and spirit. And to share the experience with your friends and family is truly to create memories for a lifetime. Vancouver is said to be one of the most beautiful cities in the world, surrounded as it is by ocean and mountains. You’ll also visit Victoria, famous for its gardens and its English feel. Then there are the smaller, quirkier places – Telegraph Cove, Port Hardy, Prince Rupert, Jasper and Banff – each place has its own unique character. We offer an extensive array of daily options to help you experience this journey in your own special way – from a city walking tour to a grizzly bear expedition; from a canoe trip to a ride in a motorcycle and sidecar. And, of course, if these activities are not quite what you dream of, our friendly Canadian insiders are standing by to help you co-create your trip of a lifetime. Vancouver is a vibrant and exciting city with a welcoming vibe. Today you arrive in Vancouver and a private transfer takes you directly from the airport to your hotel. The rest of the day is at your leisure, so take a walk around Stanley Park, check out some of the quirky shops and art galleries or contact your Vacation Advisor to arrange a tour of your interest. This small group bus tour will allow you to enjoy the views along the Sea to Sky Highway as you journey to each tour destination. Visit the quaint seaside village of Horseshoe Bay before taking a ride on the stunning Sea to Sky Gondola. Feel the spray from Shannon Falls, British Columbia’s third highest waterfall, before ending your day at Britannia Mine Museum. The quaint seaside city of Victoria is located on beautiful Vancouver Island, and today you travel to the Island to visit it! The city offers a fascinating blend of West Coast culture and British charm. There's no better way to spice up your southbound journey from Vancouver to Victoria than by combining it with a little whale watching. As you travel through the protected waters of Haro Strait and the Strait of Juan de Fuca to Victoria, search for the majestic wildlife that floods the local waters! Enjoy a comfortable motorcoach transfer from Vancouver to Victoria today, including a 90-minute ferry ride offering spectacular views and ample opportunities for wildlife sightings, as you pass through the Gulf Islands and Strait of Georgia. Today you’ll enjoy a seaplane flight from downtown Vancouver Coal Harbour to Victoria. Your flight will take you over the Gulf Islands and Howe Sound as you cross the water to the Island. Victoria has much more to offer than initially meets the eye. We want to ensure you get to discover the city’s hidden treasures with an activity today. Today you start your adventure to the beautiful northern part of Vancouver Island. The culture and history of the Indigenous people become to come alive as you find yourself getting more immersed in the local happenings and small towns you pass through along the way. Enjoy the freedom of exploring by vehicle. Your rental includes loss damage waiver and unlimited mileage. Overnight at Telegraph Cove Resort. Tucked away on the eastern coast of Northern Vancouver Island, the resort offers a variety of accommodation choices, including cabins, historic homes, modern condos and a lodge. Enjoy comfortable accommodation, beautiful ocean views, historic surroundings, and excursions like whale watching and fishing available right on your door step. Explore the magnificent wilderness an scenery that surrounds you ask you wake up to the amazing views at Telegraph Cove. Enjoy a tour today to explore the array of wildlife set away from the disturbances of civilization. 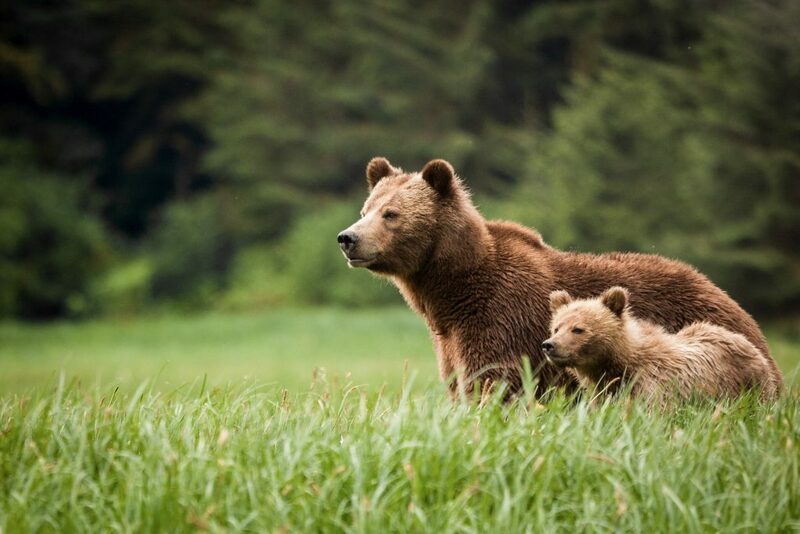 Get up close and personal with British Columbia’s grizzly bears on this intimate and immersive wildlife watching experience. Enjoy the majesty of the coastal mountains as you explore spectacular inlets to find grizzly bears, all from the safety and comfort of a viewing boat. The drive today is short, giving you the opportunity to discover the quaint fishing town of Port McNeil and take a short ferry ride over to village of Alert Bay. Alert Bay not only offers a tranquil setting and spectacular views of the strait, it is rich in Indigenous history. After a day of sightseeing you will drop off your car in Port Hardy and prepare for your Inside Passage ferry tomorrow. Overnight at The Quarterdeck Inn and Marina. This accommodation is situated at the edge of Port Hardy, offering waterfront access and a full-service marina, all within a 15-minute walk of downtown. The resort is a popular launching spot for year-round recreational activities, with pristine beaches, hiking trails and more all near by. During your stay, enjoy a pub and restaurant offering panoramic marina views, complimentary Wi-Fi, and laundry facilities if needed. Inhale the fresh clean air on the deck of the ship as you admire the views along the Inside Passage. Lush green coastal mountains, thick old-growth forests, tranquil grey-blue water and perhaps even a soaring hawk or eagle - this unspoiled scenery will captivate your imagination. Cruise through the world-famous Inside Passage aboard a well-appointed vessel. Take in the rugged and beautiful scenery of coastal fjords and mountains as you relax in the Aurora Lounge. Watch for wildlife around the ship and remote First Nations villages tucked into bays along your route as you make your way from Port Hardy to Prince Rupert. Overnight at the Crest Hotel. Experience breathtaking views of Prince Rupert’s magnificent harbour and pristine mountains from the comfort of this hotel. You will be located just a short stroll to the Museum of Northern BC, Cow Bay shopping district, and only minutes from the ferry, VIA Rail, and airline terminals. Hotel amenities include a restaurant, pub, cafe, complimentary Wifi, fitness centre, and an outdoor hot tub. There is plenty to discover in this Northern BC town! Prince Rupert is the land, air, and water transportation hub of British Columbia's North Coast. The sheltered harbour is the deepest ice-free natural harbour in North America, and the 3rd deepest natural harbour in the world. Prince Rupert is the starting point for many wildlife viewing trips. On specific start dates, you have the option of venturing into the Khutzeymateen Wilderness in the heart of the protected Great Bear Rainforest by boat for grizzly bear or whale watching. Please inquiry with your Vacation Advisor for seasonal availability when you call. Enjoy a privately guided canoe trip to explore the rugged and unspoiled waters of Prince Rupert. You will find yourself surrounded by mountains and pristine vistas while exploring shorelines and learning about the rich history of this area. Today you begin your two day train experience onboard the VIA Rail Skeena Train. Enjoy the untouched landscapes rolling by your window as you make your way to the northern city of Prince George where you spend the night in a hotel. Board VIA Rail's Skeena train in Prince Rupert and travel to Prince George today. Great stretches of wilderness, lakes, and rivers are punctuated by small settlements, farms and sawmills. Wildlife such as bear, moose, elk, deer, wolves, coyotes, eagles, hawks and seals may be seen during the trip, depending on season and chance. You will be seated in a spacious, reclining seat in the Panorama Dome car. Hot and cold meals will be served at your seat. Enjoy access to the Park car, offering additional space to relax and enjoy the panoramic views. Overnight at the Coast Inn of the North. Located in downtown Prince George, in the heart of the gateway to the North, this is the ideal home base for exploring the area. Hotel amenities include multiple on-site dining options and a cafe for your morning coffee fix, an indoor pool, sauna, and hot tub, complimentary WiFi, complimentary self-parking, and a fitness centre. Continue your train journey toward the Canadian Rockies. The Skeena Train has large windows perfect for viewing the rugged peaks and dense green forests all around you. Sit back with a cup of coffee and admire the views. Upon arrival, pick up your rental car and spend the night in the small mountain town of Jasper, a quiet retreat surrounded by pristine alpine wilderness. Continue your train journey toward the Canadian Rockies. The Skeena Train has large windows perfect for viewing the rugged peaks and dense green forests all around you. Sit back while enjoying your included meals and admire the views. Spend the day exploring the jewel of the Rockies, Jasper. It's been called the gentle giant of the Rockies and this small mountain town offers visitors a more laid-back mountain experience - with equal options for adventure, discovery and relaxation. Today journey along the world famous Icefields Parkway to Lake Louise. It's one of the most scenic stretches of highway in North America! Sit back, relax, and enjoy the scenery as you make your way through the Canadian Rockies. Enjoy the morning at leisure exploring the many activities and stunning scenery Lake Louise has to offer. Later today, make the short drive to the more bustling mountain town of Banff. Wake up to the sound of mountain songbirds and the scent of pine trees in Banff. Take a full day to discover the wilderness surrounding and fill your lungs with cool, fresh Rockies air while you head out for a day of exploration. Wave goodbye to the Rocky Mountains as drive to the Calgary Airport to catch your flight home. The amazing sights you have seen on your Canadian adventure have become memories that you will never forget. Price of your trip may vary depending on activity choices. In Prince Rupert, Grizzly Bear Viewing is available from mid-May to end of July 2019 and Whale Watching from August to end of September 2019. Some activities may not be available on all trip start dates, due to seasonal weather conditions and wildlife activity. Your Vacation Advisor can provide further details. Our trip was well planned and coordinated. We had a delightful time. We did have a few issues along the way but the Fresh Tracks staff did a great job of taking care of them. I liked the variety of scenery in British Columbia. The west coast had a particular charm with water, islands, the coastal mountains, and wildlife as the attractions. Traveling through the Coastal Mountains to the Caribou and Rocky Mountains was dramatic and spectacular. The beauty of western Alberta was as dramatic, but I really liked the quaintness of Jasper. My travels from Banff back to Vancouver was also a revelation. The rivers and the landscapes west of Kamloops were so different than other scenic places on the trip. My camera never stopped clicking. I was taken care of like royalty. The views were beyond remarkable and awe-inspiring. I truly did not have to think of anything because Fresh Tracks did so much preliminary planning. Fresh Tracks was truly amazing. They were knowledgeable, helpful and thought of my specific needs in putting this trip together. Fresh Tracks – as well as Canada, exceeded all expectations. It was amazing and had a great time. Everything went very well and the hotels were amazing. The people and everything else was fantastic. We took over 3000 pictures and did see many animals. You set everything up above my expectations and I thank you. Maybe considering another vacation to Canada in the future. Thank you for making it a memorable vacation. We have safely returned home after a splendid trip around your great country and British Columbia. Jan and I extend our thanks for all your efforts to arrange this trip and make it a very special one indeed. It turns out my initial worries were quite unfounded and all went extremely well. We will recommend this trip to friends and neighbors and without hesitation refer them to Fresh Tracks Canada and you personally for travel assistance.